Description: Shortly after another Z Train with 3 GE's zooms over the diamonds. Description: A great BNSF crew waves and blows the horn to me and my son as we photograph them near the Waveland Museum Lane Crossing in Lexington on a warm January day. BNSF 4652 is leading with help from BNSF 5273. The train is a mixed load. Description: A westbound intermodal on the Staples sub at Frost Rd crossing. Description: EB TOFC approaches UP interchange at MP 737.3 of the BNSF Needles Subdivision/California Division. Description: The last few rays of sunlight catch this Westbound as it traverses the wye at MPLS Jct. Description: Loaded taconite train detours on CN's Fulton Sub. Description: Loaded taconite train rolls through Memphis on CN's Fulton Sub. Taconite must really be heavy because the cars are only halfway loaded. Description: BNSF 5273 leads a westbound train into Naperville. Description: Trailing Dash 9 on the tac emptys as it rolls through Union Jct. 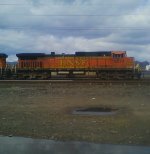 Description: Two BNSF GEs bring an empty tac train past Union Jct on a nice Sunday afternoon. Description: Westbound with a CP ES44AC in tow.